In 1834, an alliance was formed between the Spanish regime and Great Britain, France and Portugal to support Queen Isabel in her struggle against Don Carlos. Lord Palmerston's Whig government was sympathetic to the more liberal regime of Queen Isabel. By the time of this "Quadruple Alliance", Britain had already had some involvement in the civil war that had struck Portugal; in July 1833 a Royal Navy squadron under Admiral Sir Charles Napier had defeated a pretender fleet in the fourth Battle of Cape of St Vincent. Now, in support of Isabel, British ships patrolled the north west coast of Spain in an attempt to police the flow of arms to Carlists. In 1835, following a run of Carlist victories in the field, the Spanish Ambassador to the Court of St James asked the Lord Palmerston's government if more direct military assistance could be provided in Spain (the Ambassador, General Miguel de Alava, was said to have been the only man to have been present at both Trafalgar and Waterloo). Given the government's reluctance to commit British regulars, the Ambassador asked if Spain itself could recruit volunteers to form a legion that was equipped and paid directly by the Spanish crown. This was agreed to, although it necessitated a suspension of the Foreign Enlistment Act which prevented British subjects from entering the service of a foreign power. Recruiting and training began in 1835. The Legion was to comprise of 8,500 infantry (in 10 battalions), 550 rifles, 700 cavalry and 300 artillery. The men were all volunteers. Many, if not most of the rank and file would have had no experience of soldiering. The officers came from a variety of backgrounds: some were bored regular army or East India Company soldiers who resigned their commissions and joined the Legion to see some action; others were political idealists wishing to fight the forces of reaction and absolutism. Command was given to Colonel George de Lacey Evans, a 48-year old Waterloo veteran. Support for the Legion divided along party political lines. The Tory opposition objected to a British mercenary force fighting against Don Carlos in the name of the Catholic church (disregarding the fact that Carlos had the support of the more extreme end of the Catholic church). The Duke of Wellington, aided by the commander-in chief of the British army, Lord Hill, was instrumental in the establishment of a ban on the appointment of regular British officers to commissions in the Legion. Nevertheless, some officers defied this ruling, either taking leave or selling out in order to join the Legion. I will describe the fortunes of the Legion in later posts. 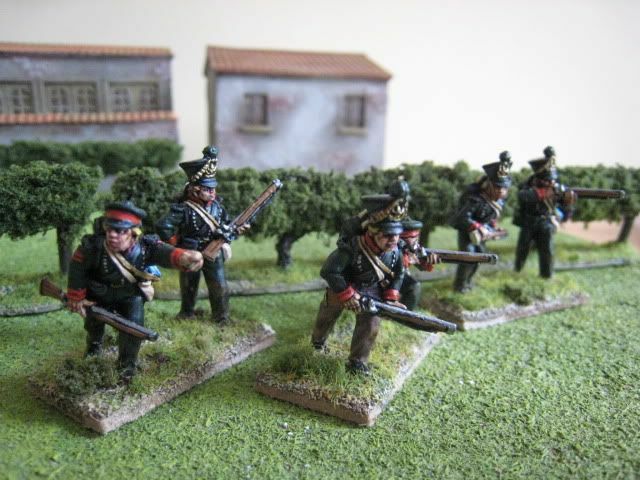 This first unit is the 9th Battalion, the Irish Grenadiers. The Legion had 3 Irish infantry regiments, which were brigaded together under Brigadier-General Charles Shaw, a veteran of 1815 and the Portuguese civil war. The brigade quickly won a reputation for being one of the toughest units of the Legion. 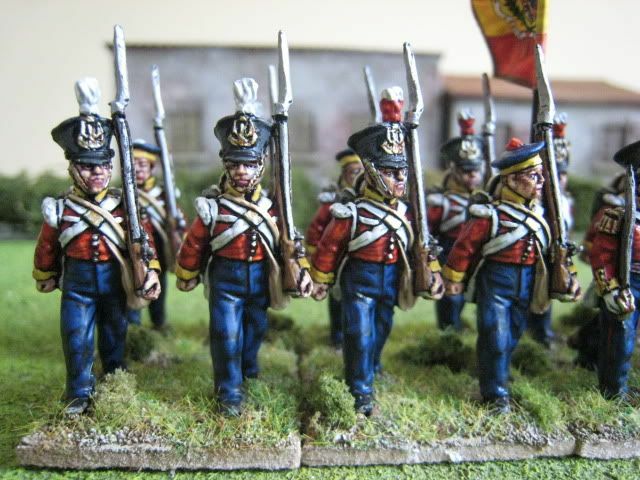 The uniform generally follows that of British line infantry of the period. 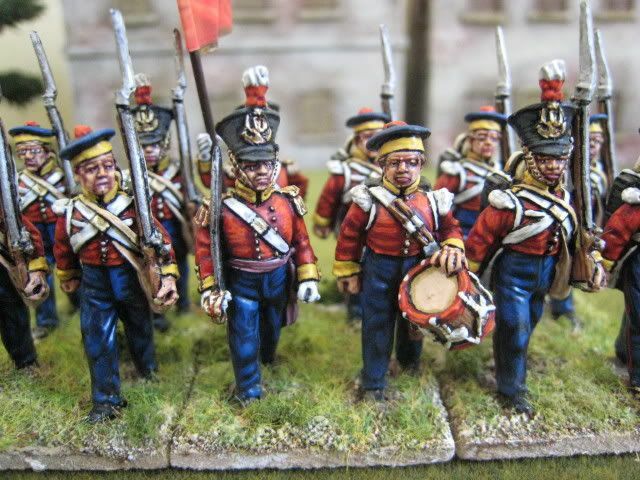 I have combined figures in shakos and forage caps. 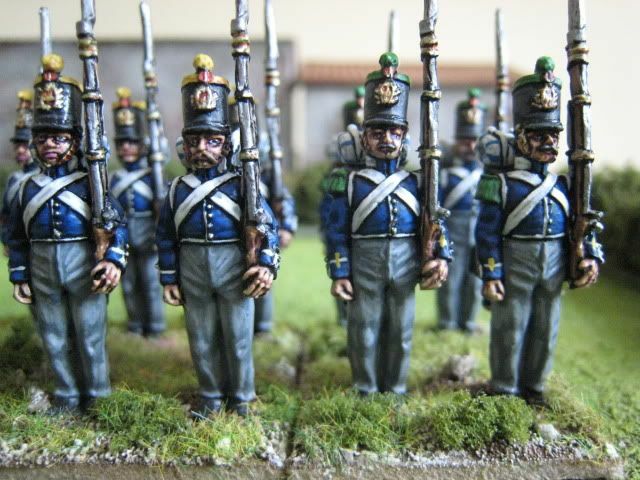 The grenadier company has white plumes and tassles, the light company has dark green. Trousers are reported as being white in summer and "Oxford blue" in winter, which is what I have adopted here. There are a couple of "goggle eyes" in the ranks. I admit that it's taken a bit of practice to get used to painting the eyes on Michael Perry's figures for this period. I think I've now worked out how to do it, but some of the early figures should really have ben re-done. The trousers were painted with Foundry palette "British Royal Blue 74", highlighted with the A and B shades of "Deep Blue 20", as palette 74 is far too dark to have much of an effect. 20 figures. Painted April/May 2009. Flag by Adolfo Ramos. Artillery seems to have been little used in the First Carlist War, largely due to the nature of the terrain and a lack of draught animals. Larger guns were difficult to move around the mountains of northern Spain and both sides quickly realised that smaller calibre guns, capable of being carried on the backs of mules, would be the most viable form of artillery support. This required a certain amount of re-training and re-equipping the artillery with mountain guns, usually 6 or 8 pounders and howitzers. 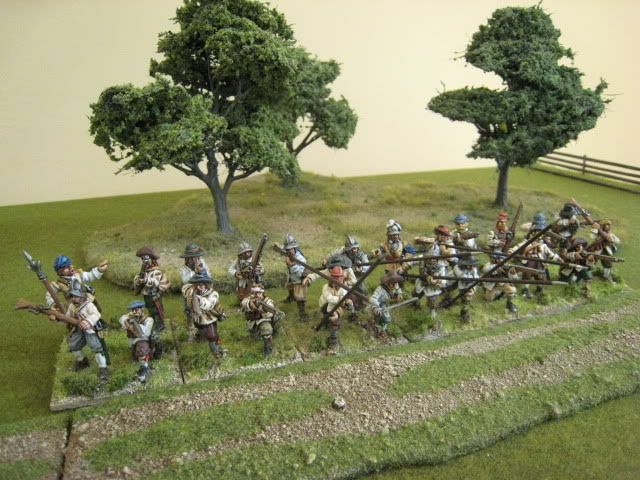 The regular army consisted of Guard, foot and horse artillery units. The horse artillery had a rather flamboyant uniform with a tapering shako and a coatee with red facings and yellow grenades on the collar and turbacks. The horse artillery element seems to have expanded to 12 batteries during the war. 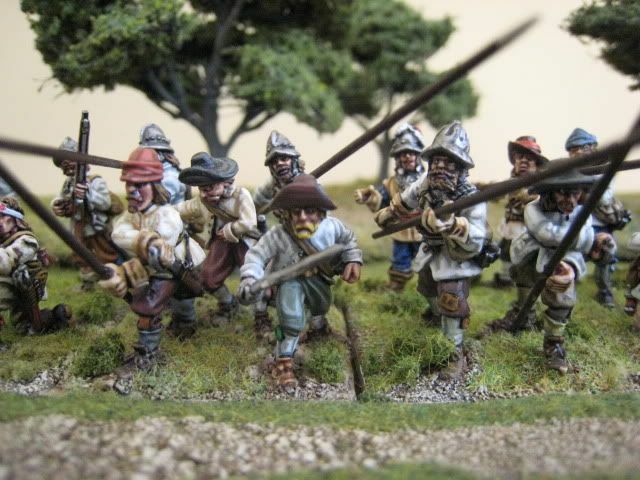 The Isabelinos had the edge over the Carlists in terms of artillery support, as the latter had to rely mainly on capturing guns and di not have access to the ready supplies of ammunition that the Isabelinos had. 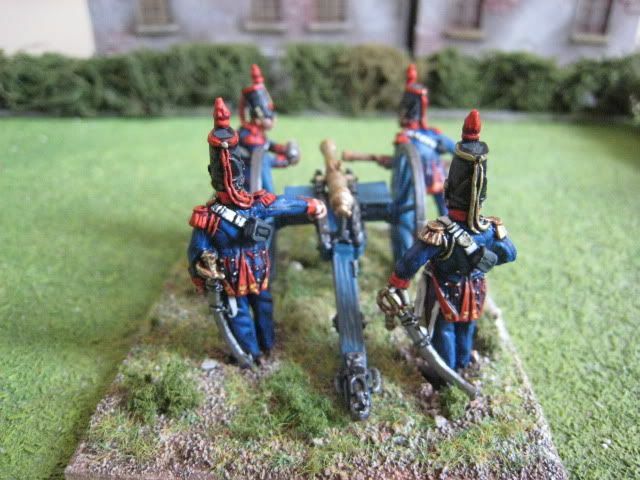 But both sides never really gave full support to their artillery - it was seen as a means of providing some support to the infantry and never an offensive arm in its own right. 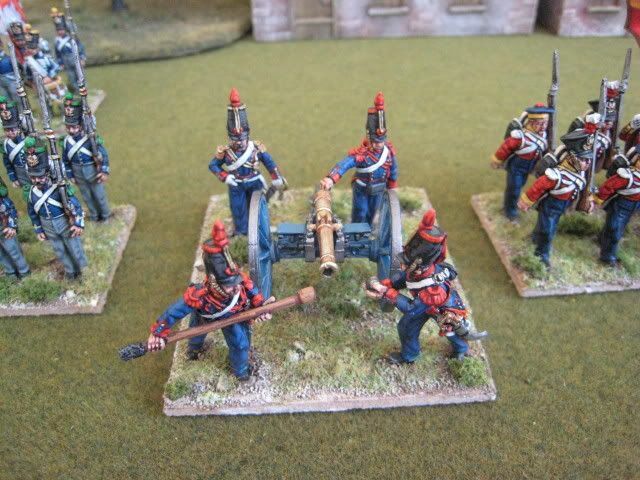 These Perry figures have a British 6-pounder gun. 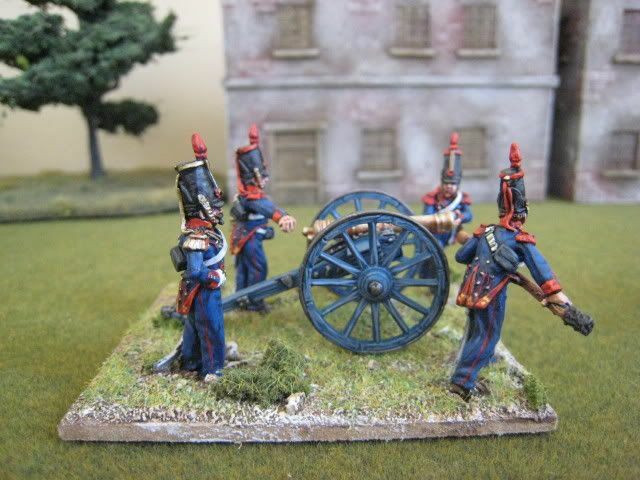 I painted the gun with the new Foundry "British Blue Grey" palette, from their "authentic" Napoleonic range. 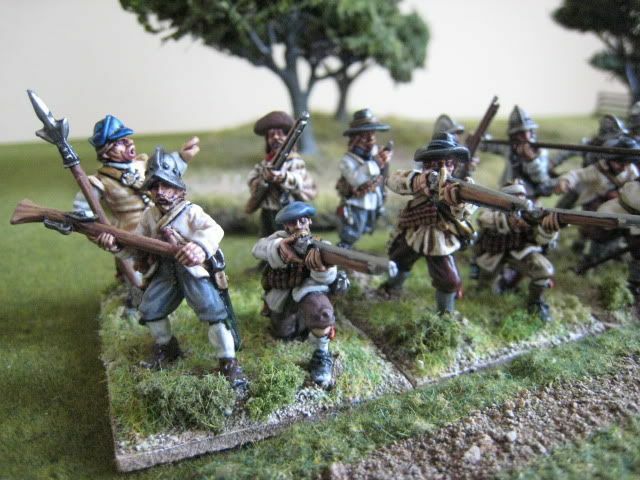 In addition to the First Carlist War, I'm currently also working on a Royalist army for the English Civil War. 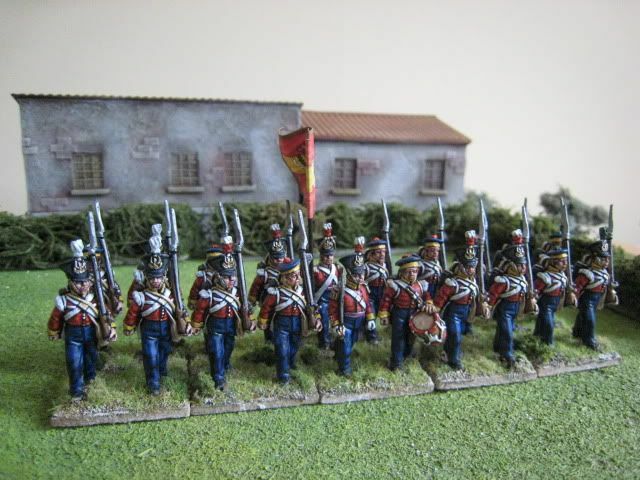 This is the first completed infantry regiment. It's currently lacking flags, but it's going to take me a while to work those out so I thought I'd post these pics anyway. 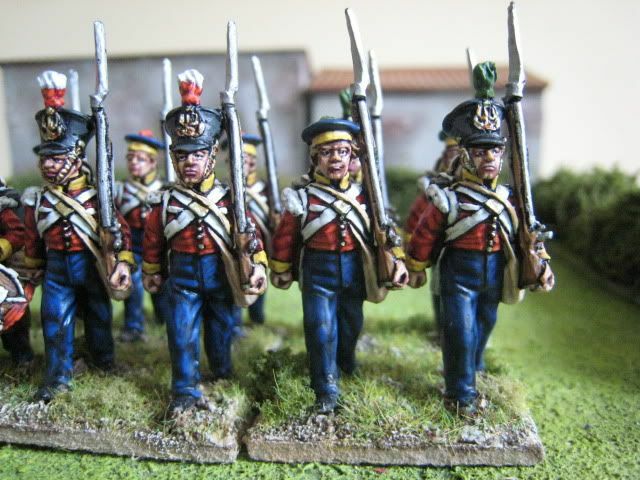 This unit is nominally the Marquis of Newcastle's Regiment, one of the whitecoated regiments that fought at Marston Moor. 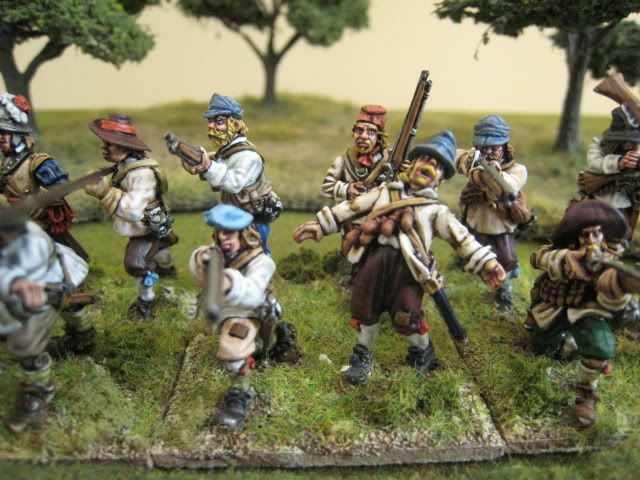 Being part of the northern Royalist army, a couple of the soldiers have blue scottish caps. 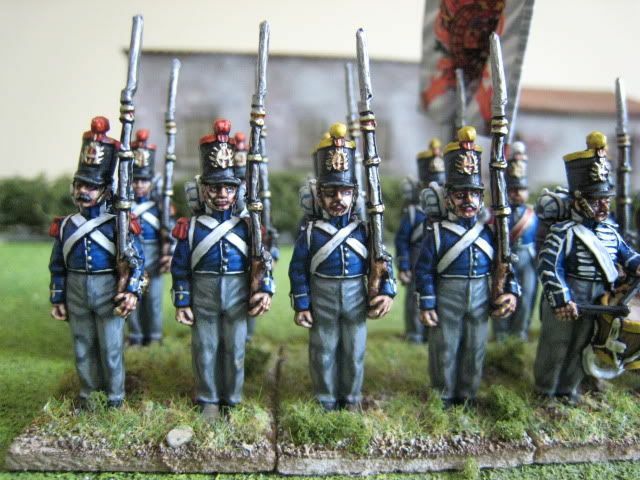 The white coats themselves are in various shades to add variety, but I tried to unify the regiment by painting the caps and monteros light blue. 24 figures. Painted August 2007 and May 2009. The rubber road was made by Kerry Thomas (aka NZ's "Valleyboy"), whose excellent "how-to" article is in issue 16 of Battlegames magazine. Isabelino forces comprised several elements, including the regular army, provincial and national militia and the foreign auxiliary units. 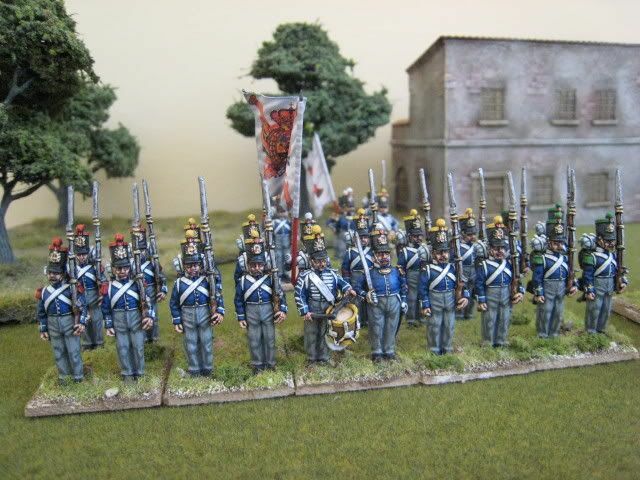 Line infantry regiments each consisted of 3 battalions up to January 1835 and then 2 battalions henceforward. 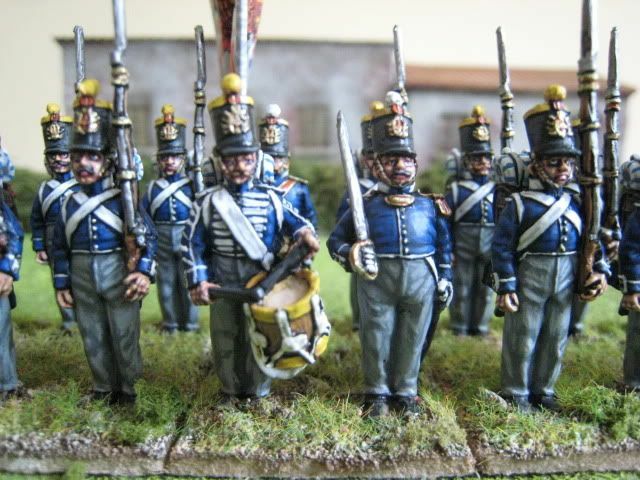 In 1835 there were some 21 line infantry regiments, the oldest of which could trace their origins back to 1537. An infantry battalion had 8 companies each of about 90 men: one of grenadiers, 6 of fusiliers and the a final 8th company of light infantry cazadores. This gives a theoretical total per battalion of about 720 men, but of course it is extremely unlikely that this strength was seen on the field. At a ratio of 1:20, 8 companies would equate to 4.5 figures each, so providing a battalion total of 36 figures at full strength. 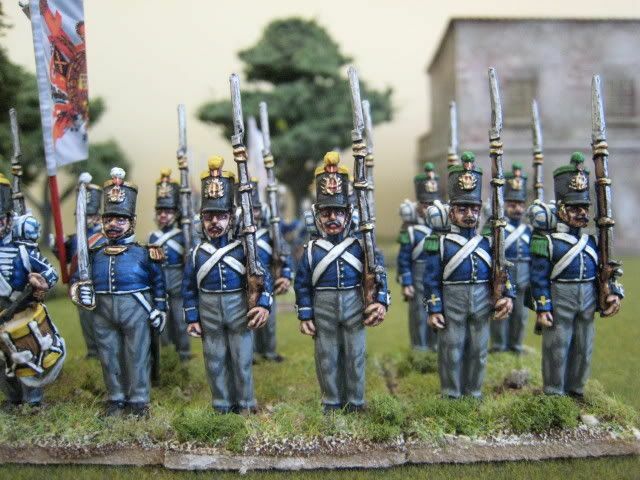 I have decided that I want to limit a "full strength" battalion to 20 figures (basically for painting turnaround and game size reasons), which would provide a nominal ratio of 1:33 or thereabouts. 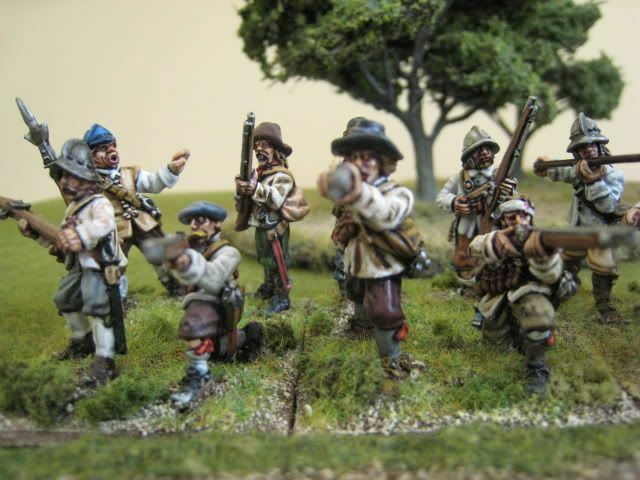 For aesthetic purposes, I want each battalion to have separate bases for the grenadier and cazadores companies, and so I have orgainsed each unit into 5 bases fo 4 figures, with 3 bases of fusiliers and 2 each of the flank companies. That is bending the ratio somewhat, but I'm assuming that it won't matter if I apply the same principles across all the armies. The general lack of readily available information on regimental combat histories means that line regiments can be used quite generically. The uniforms do not, generally, have regimental distinctions, although the flags were different. 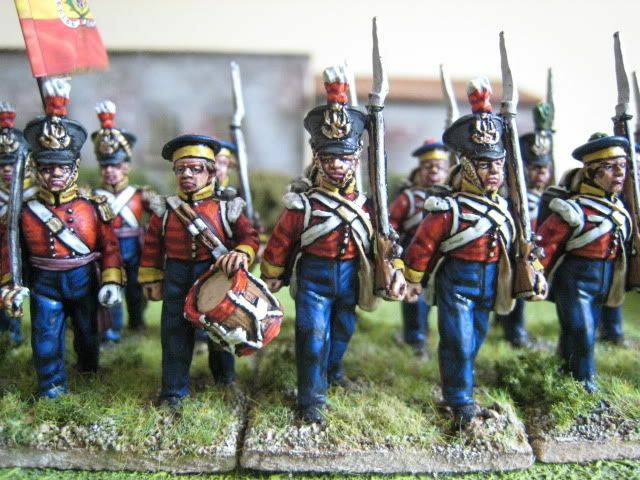 For my first Isabelino line regiment I chose the Princesa Regt simply because it was known to have been present at a couple of the battles described in the Cairns/Perry book. The full-dress uniform for regular army line, in most cases, was a deep blue ("turqui") coatee with white piping and trousers that were white in summer and grey in winter. Company distinctions were yellow for fusiliers, red for grenadiers and green for cazadores. The shako, either cylindrical or bell-topped, would often be swapped for a cap when on campaign. 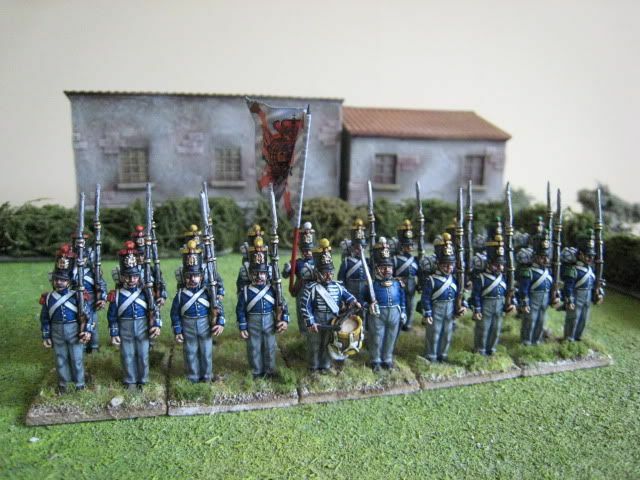 This is the first of two battalions I have painted up for the Princesa Regiment, both in the standing at arms pose. I went for the grey, winter trousers largely because it makes a pleasant change from painting white! 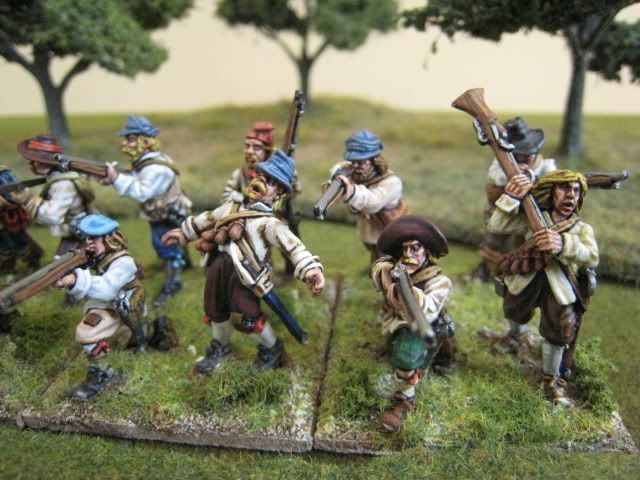 The 25mm figures are of course from Perry Miniatures. The flag is by Adolfo Ramos, available in the UK from North Star. 20 figures. Painted April 2009. The First Carlist War proper lasted from 1833 to 1840, but the tensions behind it were to cause outbreaks of violence at various times up to the civil war of the 1930s. It is a simplification to say that those tensions were, first, between supporters of absolute monarchy and those who wanted greater democratic representation (who were referred to by a new word, "liberals") and, secondly, between the supporters of Don Carlos, the brother of King Ferdinand VII and those who were loyal to Queen Isabel II. But the catalyst for the call to arms in the early 1830s was the death in September 1833 of King Ferdinand VII , father of Isabel and brother of Don Carlos. Ferdinand had ruled since the expulsion from Spain of the French in 1814. At the time of his accession, the Spanish monarchy was subject to the Salic Law, i.e. that no female could inherit the throne. Ferdinand overturned the Salic Law in 1830, arguably without due consultation and consent of parliament and/or in contravention of the constitution. Doubts as to the legitimacy of Ferdinand's actions meant that when he was succeeded by his infant daughter Isabel (with his wife Christina as regent) those who supported tradition, absolutism and the primacy of the Salic Law had a case for supporting a male pretender. That pretender was Don Carlos and his supporters became known as "Carlists". The army largely remained loyal to Isabel and Christina; with men and officers drawn from all ranks of society, the army was a natural supporter of "liberalism". The Carlists drew support from all over the country, but particularly in remoter areas which had retained local traditions and some autonomy, and which considered a centrist liberal government as a threat to their way of life. A "hotbed" of Carlist support was the Basque region of northern Spain and many important campaigns took place in this area. The ensuing conflict, in which troops from Britain, France and Portugal participated, was bloody and vicious. I am still very much "feeling my way" in this period and intend to add a bit of history to each post on it. This is also to ease the lack of hard information about the battle record of individual regiments and units. 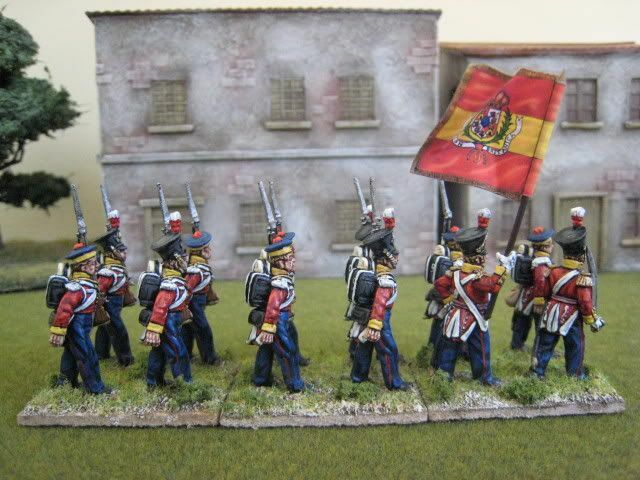 Unlike the AWI, many of the battalions I paint will have a generic use, particularly the Spanish units. But there are a few similarities in the two periods: the First Carlist War requires little cavalry and artillery (largely due to the nature of the terrain); it was a nasty civil war in which people switched sides often; the main combatants were joined by auxiliary troops from other nations; the nature of the fighting and terrain often required loose, open-order tactics. To me, these are some of the attractions of the period.